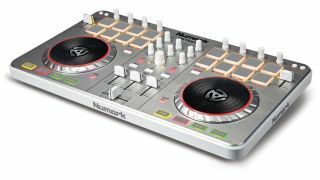 NAMM 2013 PRESS RELEASE: From Numark, the world's leading creator of DJ technology, comes Mixtrack II - now with a streamlined design and an expanded layout of professional controls, including 16 backlit multifunction drum pads and illuminated touch-activated platters. Connect to your computer and start DJing today; Mixtrack II comes with Virtual DJ LE software so you can start mixing right away. Get your hands on Mixtrack II's extensive layout of DJ controls, which includes automatic beat sync, hot cues, and looping. Add effects like flanger, phaser, and echo, and experience your music like never before. Mixtrack II comes tailor-made for dynamic performance. Create loops, launch samples, and control hot cues with the 16 backlit rubber drum pads. Instantly switch between Loop Mode, Sample Mode, and Hot Cue Mode. Mixtrack II's new slimline low-profile design is made to be played with a complete mixer section, precise crossfader, 3-band EQ, and dedicated music library navigation controls. You'll be able to spend more time interacting with the music and less time staring at the computer screen. Pitch and Sync controls are onboard for seamless and easy mixing and 16 dedicated effects controls let you add and manipulate flanger, phaser, echo, and more. Get precise control over every track and every transition with Mixtrack II's advanced low-profile platters. Both are capacitive and dual-zone, giving you the ability to scratch or stop a track simply by touching the top of the platter, while at the same time allowing you to adjust the pitch by manipulating the platter from the side. Start mixing right away - with the included Virtual DJ LE sofwate you can create professional sounding mixes at home or easily updgrae to Virtual DJ Pro for performing live at parties, functions, and clubs. Plus Mixtrack II operates via standard MIDI, so it's compatible with virtually any popular DJ software. With its built-in audio system, Mixtrack II is ready to go right out of the box. Plug in your headphones, microphone, and PA system and start mixing right away with no external audio interface needed. Plus, Mixtrack II has two headphone jacks, making it easy to mix with friends and fellow DJs or tradeoff in-between sets.